I've been reading a review copy of a mixed-media journal book and I was inspired to make this little canvas. I didn't really copy any of the projects in the book , just used some ideas and picked things like collaging with torn paper, using book pages etc. I used a Penny Black stamp , acrylic paint, a Tim Holtz stencil and Distress Ink re-inker (on the hair). The book is The Painted Journal by Jeanne Oliver. I posted a review of it here. Wow - your girl canvas looks so pretty! Great you shared it with us at Try It On Tuesday and Art Journal Journey! Much appreciated! Your canvas is beautiful - fab girl - lovely details. Wonderful image! You have been very inspired by your book, great result. I like how the background texture and the texture of the dress fit together. You draw beautifully. I love her soulful face and the way her hair hangs down around it. But of course, the background is amazing, and the way you placed the focal image on a book page was incredible. I was actually mesmerized when I first saw it. We are truly grateful that you shared this with us at Art Journal Journey. I personally hope to see more of your art in the near future, Marina. Oh that clever and so good! 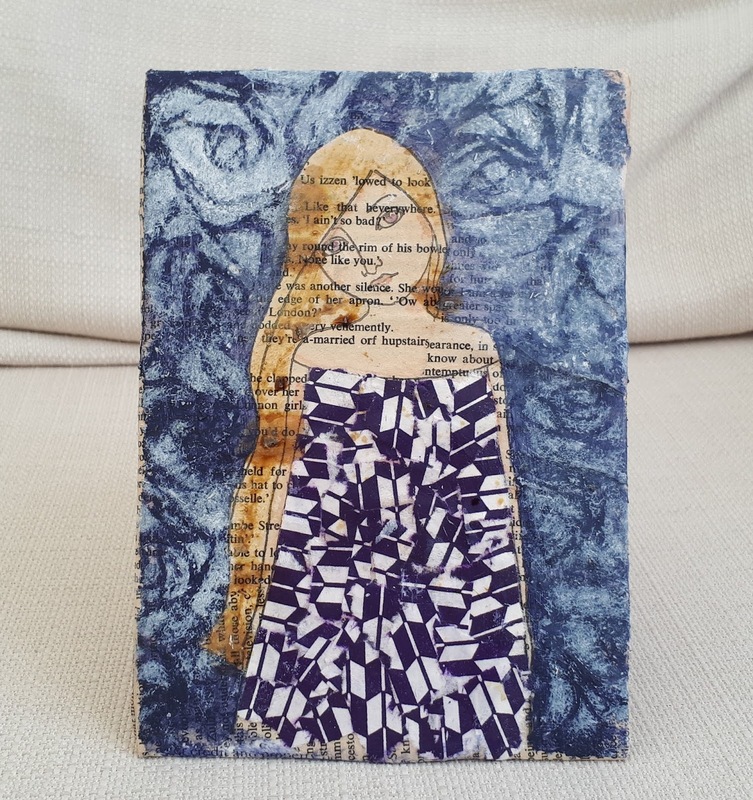 A fabulous canvas Marina, love the girl image and what you did with the torn papers. That is so cool, Marina. Reminds me of a collage of ripped paper I did once with a photo of our pooch. That was fun. You've gotten a fabulous effect on her dress. I love that. I'm totally in awe, Marina--amazing piece of art! I enjoyed your comment on the card for my uncle. I really didn't think we had a relationship--nothing bad, just didn't ever see each other. So having him send me the credit card was a total surprise. I've only seen him once since college, but we exchange Christmas cards & I've never forgotten what he did for me. The interesting thing is, too--his first wife was my mom's little sister, so that's why he's my uncle. But my aunt was tragically killed by a drunk driver when I was in high school. Yet he reached out to me & I have life long memories because of it. I do regret not making more effort to see my nieces & nephews when they were growing up. I will always be there for them, but they may not realize it. Hard being physically far apart from family. A fantastic canvas and its a lovely drawing of the girl. Thank you for sharing your art with us at Try it on Tuesdays. This is wonderful - such a great way to ring the changes, too. Love the torn paper! Thanks for joining the TIOT challenge. Great use of the text paper...and I think I spy Origami paper for the dress?! Lovely work!